Beautiful East End and Beach Views Living room has lots of comfortable seating, floor to ceiling windows making it a great conversational space. Dining room and living area have both beach and bay views. This kitchen has everything you need to cook your vacation meals Breakfast table has seating for four You will enjoy both Galveston Bay and end of island views from this balcony Master bedroom has a king size bed and access to your private bay view balcony. Plenty of room for a quite end of day retreat. A private balcony adjoins the Master Bedroom Master bath has a soaking tub, glass enclosed shower along with double vanities. 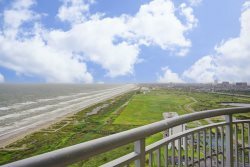 Second bedroom is furnished with a King size bed and day bed and great views of Galveston Bay En suite bath has a vanity with granite countertop and a glass enclosed shower. Third bedroom has a Queen size bed and access to bay water view balcony. Third bath has a single sink and glass enclosed shower Expansive ocean views with plenty of comfortable seating and electric grill. 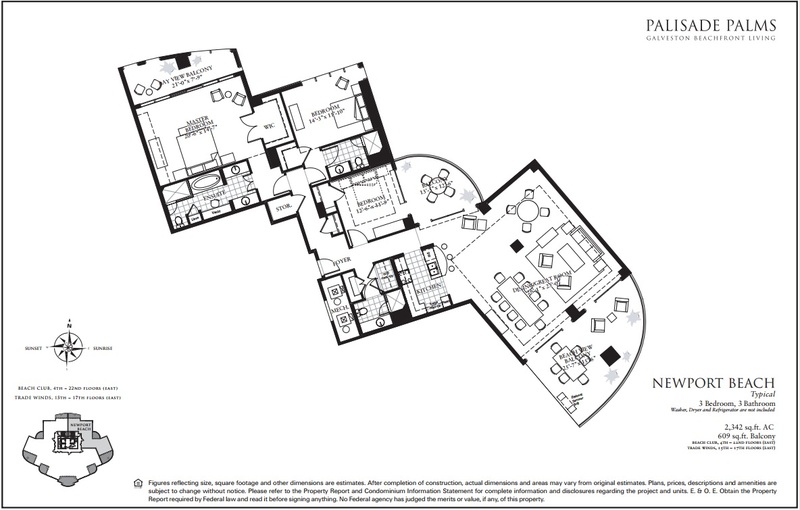 Spacious 22nd floor luxury condo has ample room for the family to spread out! Fabulous views of the east end of the island. This unit has three bedrooms, three full baths and three private balconies which make it the ultimate vacation home. It is beautifully decorated throughout and has plenty of seating in the living area, making it a perfect conversational space. The open floor plan allows everyone to be included in the large space. Enjoy a fully-equipped kitchen with stainless appliances, granite counter-tops and a custom breakfast table with seating for four. The dining area seats eight and looks out onto two of the balconies. The grand master suite includes a king bed and sitting area with access to a private balcony. The huge en suite master bath includes a separate glass shower and tub, and has a built-in vanity with dual sinks for preparing for the day. The second bedroom has unique corner windows overlooking the bay and a glimpse of the beach. It is furnished with a King bed and a day bed. The en suite bath has a walk-in shower. The third bedroom is furnished with a queen bed and a access to the bay side balcony with great views. In this unit, everyone has a place to enjoy their beach vacation getaway! Please note, this unit only allows check-ins on Saturdays! Everyone in our group had wonderful things to say about this condo. It was very clean and accommodating. The balcony was the best part. We will definitely be back next year!! My husband & I stayed in this lovely condo for a month and I can't say enough wonderful things! The condo was very well stocked for all of our needs and we couldn't have been more pleased. The views from the 22nd floor are outstanding! Daily, we sat on the 600/sf patio, enjoying the ocean sounds and watching the pelicans fly by. It really was a perfect stay! If you're considering a rental at Palisade Palms, look no further! You won't be disappointed!